DAVID STERN was a great commissioner who guided the NBA from a struggling league to one of global recognition. Still, it took him more than a decade to solidify his power base to where his will became like law in the NBA. Newbie commissioner Adam Silver caught up to Stern in just about 3 months. Thanks to the loose lips of Los Angeles Clippers owner Donald Sterling, Silver took the biggest crisis the NBA has faced since the leaguewide drug scandals of the 1980s and quashed it in one 20-minute news conference. As a result, Silver already is being hailed by some as the best commissioner in sports. He's established credibility as a leader who will act in the best interest of the game, even if it means taking one of his 30 bosses to the woodshed for a public beat-down. It wasn't just that Silver banned Sterling for life from all associations with the Clippers franchise and the NBA and fined him the maximum of $2.5 million. But by saying he would recommend to the NBA Board of Governors - the other 29 owners - that it utilize a three-quarters vote option to force Sterling to sell all interest in the franchise he has owned since 1981, Silver solidified his power base by forcing the owners to publicly handle a problem they likely wanted to just let privately disappear. With forceful action against one of his 30 bosses, Silver instantly validated his leadership skills with NBA fans and, more important, NBA players who have always been skeptical of how much a commissioner was committed to them while he was being paid by the owners. "Today, the players believe the commissioner has done his duty," said Sacramento mayor and former NBA star Kevin Johnson, who was asked by the National Basketball Players Association to be their spokesman. "On this day, Adam Silver is not only the owners' commissioner, he is the players' commissioner." In a dramatic change of pace, Silver put the onus of cleaning up a mess on the owners. They can't hide from their responsibility without risking the type of backlash Sterling is getting. It is an uncomfortable position for billionaire owners not used to having to mete out punishment to one of their own. On Monday, Dallas Mavericks owner Mark Cuban said he thought it was a "slippery slope" to try to force an owner to sell his franchise, even if he said something so vile it offended just about everyone. "[Sterling] is obviously racist, he's obviously bigoted," Cuban said while making the case that Sterling still has the right to own the Clippers. "In this country, people are allowed to be morons. "But, again, if you're saying a blanket, 'Let's kick him out'? I don't want to go that far, because it's not about Donald, it's not about his position, it's about his mess - and what are we going to make a decision on?" By saying without question that he would get the required votes to oust Sterling, Silver basically told Cuban and every other NBA owner to start sliding. Silver put this mess in the lap of the Board of Governors, which is where it belongs. Cleaning up this mess is not the responsibility of NBA players, NBA fans or NBA sponsors. It belongs solely to the 29 other owners in business with Sterling. Now, they're stuck. Considering Sterling's checkered history of perceived racist actions, Stern and the NBA had been accused of dragging their feet on acting against an owner they knew had issues. Silver made sure the owners cannot casually dismiss it this time. He's forcing them to react in a very public manner, and he hasn't left them any space between the rock and the hard place. If any of them has even the slightest concern about setting a precedent that could come back and bite them in the behind, they can't dare express it now - not after Silver reduced an erupting public relations volcano into a smoldering campfire. "I fully expect to get the support I need from the other NBA owners I need to remove [Sterling]," Silver said. I would be shocked if the vote to expel Sterling from the fraternity was anything but 29-0.
Who wants to be the owner who has to explain why he wants to continue to associate with a public pariah who is considered racist? What owner wants to be branded as a like thinker to Sterling; invite his fan base to boycott his team; invite sponsors to dissociate from his team; and convince top-flight free agents to shun signing with his team because he supposedly harbors the same "plantation mentality" as Sterling? 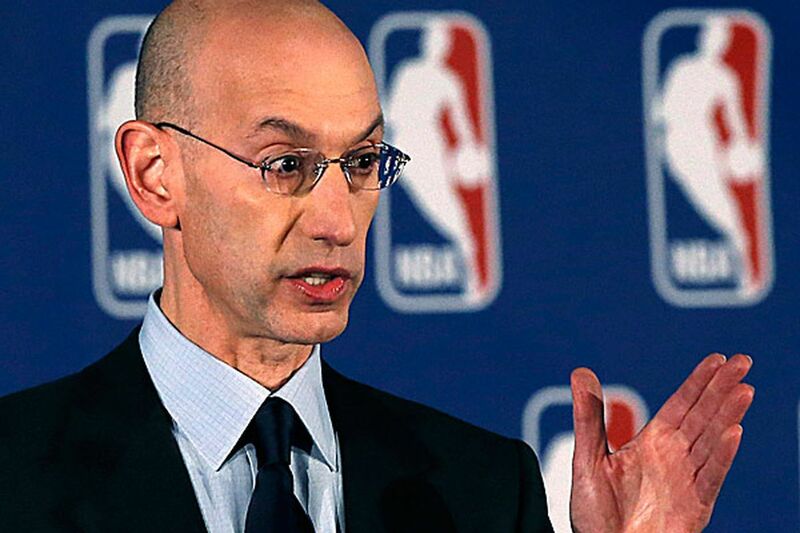 "The Philadelphia 76ers completely support NBA Commissioner Adam Silver," owner Josh Harris said in a statement. "As I have previously stated, there is no place for any type of discrimination in our society, and those hurtful and ignorant comments are contrary to the core values and beliefs of our ownership group and organization." With that on the public record, is there any doubt which way Harris has to go when this comes to a vote? How about Miami Heat managing general partner Micky Arison, who tweeted, "Great job Adam. The @NBA is in good hands. You have my full support"? Or Cleveland owner Dan Gilbert, who said, "Commissioner Silver has made the right moves in response to this unfortunate absurd spectacle"? In less than 24 hours, even Cuban had changed his tune by tweeting, "I agree 100% with Commissioner Silvers findings and the actions taken against Donald Sterling." In 30 years as NBA commissioner, Stern failed to discipline Sterling, and now it's come back to taint his legacy. In less than 3 months, Silver has all but assured that Sterling will not haunt his.